Easy to sew pattern for dress, pinafore, three collars, and two sleeve variations. These features combine so that many different outfits can be created from this pattern! A few of the possibilities are illustrated on the front cover. Others are shown on an enclosed sheet. 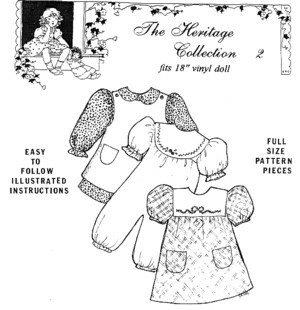 Get creative and have fun making a new wardrobe for your little one's favorite 18" doll. Pattern by Primrose Lane.